Tracy Doryland began his career at Embry-Riddle after retiring as a Naval Aviator in August, 1979. He served as the initial Aeronautical Engineering Department Chair and taught coursework over his 25-year academic career that ranged from Introduction to Aeronautical Engineering, to Turbine and Rocket Engines, to a Student Success course. 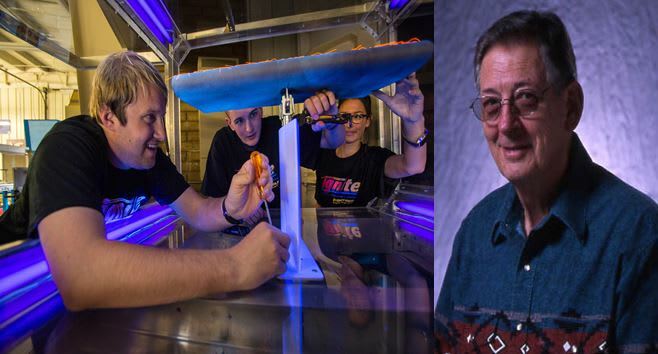 Throughout his career, Tracy and Nancy fostered a welcoming and supportive atmosphere for engineering students. The Dorylands became surrogate parents for many Embry-Riddle students. Their guidance and stability made a difference in aspiring engineers as they became productive citizens. They continue to be very special people in the lives of those lucky students who the Dorylands have mentored. Tracy Doryland retired from teaching in December, 2005 and remains active in the Embry-Riddle community, while enjoying his leisure time in Prescott, Arizona. Pantelis Vassiliou (’86, PC) recently established the Nancy and Tracy Doryland Aerospace Engineering Faculty Support Endowment at Embry-Riddle’s Prescott Campus. An aerospace engineering graduate, Vassiliou has further offered to match any gift given by others to the endowment — up to a total of $50,000 a year over the next three years. That means, by giving now, YOU WILL DOUBLE YOUR IMPACT! 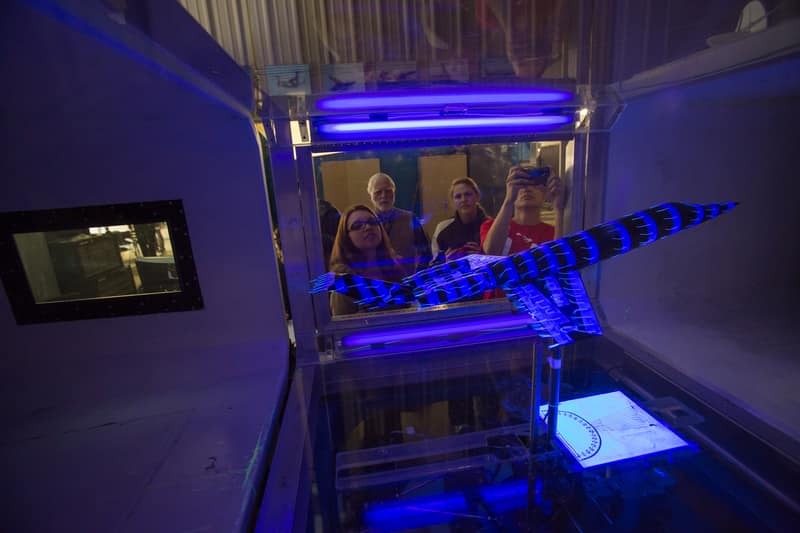 The Nancy and Tracy Doryland Wind Tunnel Lab encompasses the Robotics Lab and Propulsion labs, as well as wind tunnels which include supersonic, closed circuit, and water tunnels. This space is both a classroom and a lab for aerodynamics courses. Both teaching and testing take place here, allowing students both a theoretical and hands-on approach to learning. This lab holds seven wind tunnels, one with smoke trail capabilities, with the main wind tunnel able to reach approximately 220 mph in its closed circuit system. Open-circuit wind tunnels are available, as well as a supersonic wind tunnel that can reach speeds of Mach 3.5. Embry-Riddle is one of the few remaining universities in the country that operates a functioning supersonic wind tunnel. The supersonic wind tunnel is one with a rather small test section which relies on Schlieren and shadowgraph imaging to visualize shock-waves. The sole closed-circuit wind tunnel is one of the universities oldest wind tunnels possessing not only one of the largest test sections available, but also a six scale pyramidal balance providing students with accurate aerodynamic data. “This gift will help us maintain and improve a world-class undergraduate wind tunnel facility and enable our students and faculty to achieve even greater advances in aerospace education and undergraduate research,” says Mark Sensmeier, chair of the campus’ department of aerospace engineering. The ultimate goal is to raise $100,000 to which will forever help fund aerospace education at Embry-Riddle. Wind speed is lower than the speed of sound. Speed of more than 30,000 miles per hour. . . If you would like to discuss further giving options please contact Steve Bobinsky at bobinb97@erau.edu of 928-777-4210.